MIKI GAKKI Musical Instruments shop, to be as the biggest MI shop in Japan, is already has 120 years history in the industry. They begin to sale CME New UF series Mater Keyboard in its Osaka shop. and in it's display center, they present UF80 as main controller to show its great key touch feeling and wireless midi system. 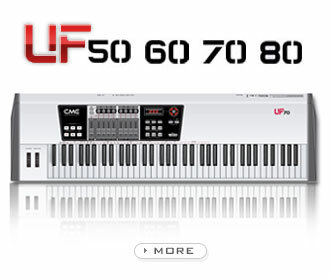 also, in the keyboard catalog, they use UF50 to let visitor try out the new coming CME keyboard.